Peaches is ready for Halloween! 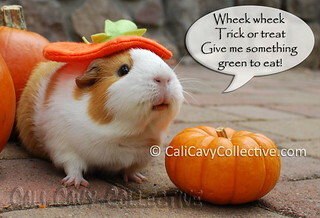 But what do cavies go trick-or-treating for? Certainly not candy corn or chocolates. Why, veggies of course. 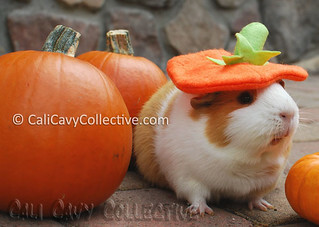 Dressed as an orange and white pumpkin in her pumpkin beret, who could refuse such a cute face? 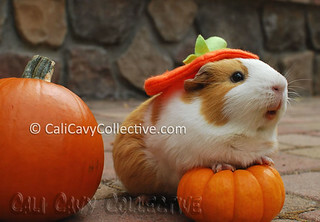 On the subject of pumpkins, did you know that guinea pigs can eat pumpkin? They can be given small amounts of fresh pumpkin as a treat - provided the rind has been thoroughly washed and the seeds have been removed. None of the piggies here have sampled any but we plan to try it out and report back with the results. It looks like Peaches is eager for a taste! I could never refuse Peaches anything, especially in her brilliant costume. Peaches says you are a superb example of a devoted peegy slave. How can you not give a treat to a piggy that cute!!!??? That's how she gets everyone!